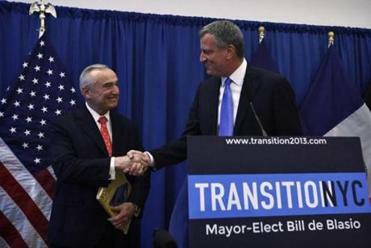 New York City’s mayor-elect, Bill de Blasio (right), named Bill Bratton his choice for police commissioner on Thursday. 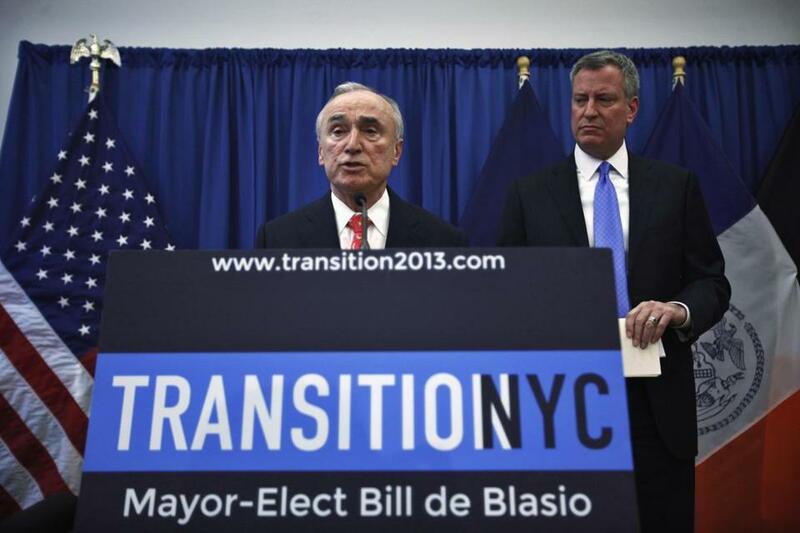 NEW YORK — William J. Bratton was named police commissioner of New York City for the second time Thursday. But it is a different place than the crime-ravaged city he came to in 1994. And he said he was going to be a different kind of commissioner, overseeing a different kind of policing. “In this city, I want every New Yorker to talk about ‘their police’, ‘my police,’ ” Bratton said after his appointment was announced by mayor-elect Bill de Blasio, before reading from a children’s book about police work he said he had cherished since he was 9. Back then, the hard-driving, press-savvy Bratton could be found dining out among city luminaries, and on the covers of newspapers and national magazines. He received a lot of credit for historic drops in crime rates, even as the trends coincided with those around the country. Such prominence drove a wedge between him and Mayor Rudolph W. Giuliani, who pushed him out just two years after appointing him. On Thursday, Bratton, 66, said he had “learned a lot” since the last time he ran the New York department, the largest in the country, and people familiar with his thinking suggested that significant changes were in store. Before making the decision to bring him back, de Blasio said he had been reassured by conversations with others who had worked with Bratton. In New York, Bill Bratton never stopped being thought of as police commissioner by many. Soon Bratton, 66, again will be the Big Apple’s top police officer. But his is perhaps the single most important and visible appointment to be made by de Blasio, who was elected partially because of his criticism of the police’s aggressive use of the stop-and-frisk tactic. Bratton has been in law enforcement for four decades, including stints as commissioner in Boston as well as Los Angeles, but this may be his biggest challenge: keeping crime at historic lows while mending the relationship with minorities, and not upstaging his boss. Bratton will replace Raymond W. Kelly, the police commissioner since 2002. A bright mood reigned at a community court in Brooklyn, where de Blasio made the announcement. De Blasio referred to an old headline calling Bratton “America’s Top Cop” before allowing him to take the microphone. “Welcome back,” de Blasio said. “You would bring that magazine cover up,” Bratton replied. It was a moment of glory light years from the day Bratton began his policing career in Boston in 1970. He first came to New York to lead the transit police in 1990. From the transit police he moved on to briefly lead the Boston Police Department before returning to New York City as commissioner in 1994. It was at a time when murders were around 2,000 a year, when squeegee-men were a fixture on the streets, when drug-dealing and prostitution flourished in the open. It was also a time of widespread corruption in the department. In his first weeks back in New York, Bratton made headlines by personally ejecting a panhandler from a subway car. Soon after, he went to Harlem’s 30th Precinct and confiscated the shields of officers who had been accused of corruption while television cameras captured the drama. He gave more authority to precinct commanders and used a computerized crime-tracking system known as CompStat to provide detailed feedback on both crimes and the police response. Crime fell, even in the most crime-ridden precincts. As arrests shot up, so too did the number of complaints against the department — complaints that received scant attention in a city overwhelmed by crime. Bratton’s national profile began to rise. How much of New York’s crime decline can be attributed to the changes he put into place has been debated for years by criminologists, who have struggled to explain the downward trends across the country through the 1990s. “If we can’t explain that it in Toledo, we can’t explain it in New York either,” said Franklin E. Zimring, a criminologist at Berkeley Law School. But, he added, “a lot of the long term success of policing in New York is something that is properly credited” to Bratton. In 2002, Bratton sought and won the top job at the Los Angeles Police Department, a shrinking and distrusted force that had entered a federal consent decree the year before. He reached out to the department’s critics early in his tenure. By the time Bratton was reappointed five years later, relations between minorities and the police had improved, leaders there said. “He helped transform the LAPD’s relationship with the community it serves while bringing crime down to historic lows,” said Antonio Villaraigosa, the city’s mayor during Bratton’s tenure. But police stops in Los Angeles doubled during Bratton’s tenure, a 2009 analysis by the Kennedy School of Government found.